Below is a cultural report of the 24-hour Kopitiam in Plaza by the Park. It is posted here for an assignment as part of COM412: Journalism Reimagined. In between the fringes of Singapore’s shopping belt and its civic district is this 24-hour food court, Kopitiam, that is part of a chain of similar stores island-wide that houses the “True Singapore Taste”. Indeed, traditionally, kopitiams are a general reference for the many independent-run shops locally that served food and coffee, but this store in Plaza by The Park, is an outlet of a corporation set up in 1988. On the evening of 14th of February 2009 I made the following observations at three different locations between 930pm to midnight. While there is a wide array of food choices, 17 different stores, they are all run under one corporation. Regardless of the stores, all staff wore a uniform — a blue cap, white top with pink mandarin collar and a blue apron with the “Kopitiam” logo. This uniformity extended to the cleaners, hired from another company, who were decked out in yellow polos with a blue collar and some wore a blue cap. Such uniformity suggests a system was being implemented in this space. As you can see in my map, efficiency was clearly in order in this Kopitiam. Distinct walkways for consumers sat next to lined up stores and were marked with different floor tiles from the sitting area. In order to maximise space usage, rectangle tables for two were placed right next to the glass panels that bordered the Kopitiam and tables for four were arranged orderly in areas A and B. Only in a small area of B did I find round wooden tables that were more common in kopitiams but were less efficient because less people could be packed into the same space. All stores used a common cutlery pool — green trays and off-white bowls, spoons and chopsticks. Only the Minced Meat Noodle and Dessert stalls used different sets, the former had bigger black bowls and the latter blue bowls. Such uniformity justifies and aids a centralised cleaning service, and this is unlike traditional kopitiams where each stall usually cleaned their own dishes. Efficiency pervaded right down to the cleaners who patrolled the place with a trolley that had separate compartments for food waste, dishes, cutlery and trays. At 11pm, the cleaners and many of the stalls had a change in staff, possibly marking the start of a new shift too. While Kopitiam tries to create an efficient dining experience like McDonalds — self-service, food is served quickly on trays that one can easily handle and cleaners constantly patrol the area to ensure that customer turnover was quick — the stall owners and customers defy this system in various ways. Stalls like the Zi Char, Hokkien Mee and Handmade Noodle often got their customers to come back for their food instead of lining up as planned. The food they served probably needed some time to prepare, and when it was ready, customers were summoned back with the distinct sound of a bell. While customers are free to sit anywhere, community enclaves were identified. Tables of Indians gathered around Jaggi’s North Indian Cuisine while men, mostly Africans, sat at section C so they could watch the soccer game projected on a screen over bottles of beer. Even the cleaners claimed the corner next to Bao Luo Wan Xiang to take short breaks. Couples usually took up seats of four instead of two, putting their bags on the other two seats. When groups bigger than four came in, they rearranged the furniture to accommodate their numbers. Food here was usually served just for one, but a family of five foreigners created their own feast by buying from different stores and sharing them. Some customers, like me, bought only a drink and sat down with their newspapers and books for hours. Two uncles sat through the whole time I was there, finishing over 6 bottles of Heineken beer — a common sight in kopitiams. After 11pm, the place was visibly less crowded and instead of customers, vagabonds started appearing. A few of them bought only a drink and were eventually slumped over the tables at the ‘sleeping corner’ near the North Indian cuisine. One example was ‘Dessert man’ whom I sat right next to for 1.5 hours. The middle-aged man armed with two big plastic bags bought a bowl of noodles and ordered a cup of tea. He had also asked for an extra empty cup. After his meal, instead of ordering desert from the stall, he took out his own. The man had brought his own bottles of juices and biscuits and was very particular about the way he ate. He began with a bottle of Bickford’s Blackcurrant juice that he poured into the cup he had meticulously cleaned before with his own kitchen towels and started eating Munchy’s biscuits, making sure his hands never touched the biscuits as he ate them one after another from the packet. Next, he opened a bottle of Gerber Apple Juice, but not before cleaning the cup with water and tissue again. For the next half an hour, he finished nine packets of Cowhead biscuits, eating only the filling and spitting out the biscuit into a waste plastic bag he had created. By the time I left at midnight, he was done with his desert and was engrossed in reading his copy of Lianhe Wanbao, not looking like he was planning to go anywhere else. Despite being a private space of food consumption, many of the customers at Kopitiam used it more than that, often as a gathering point for a community, a private space for people to read and even a home for the vagabonds. 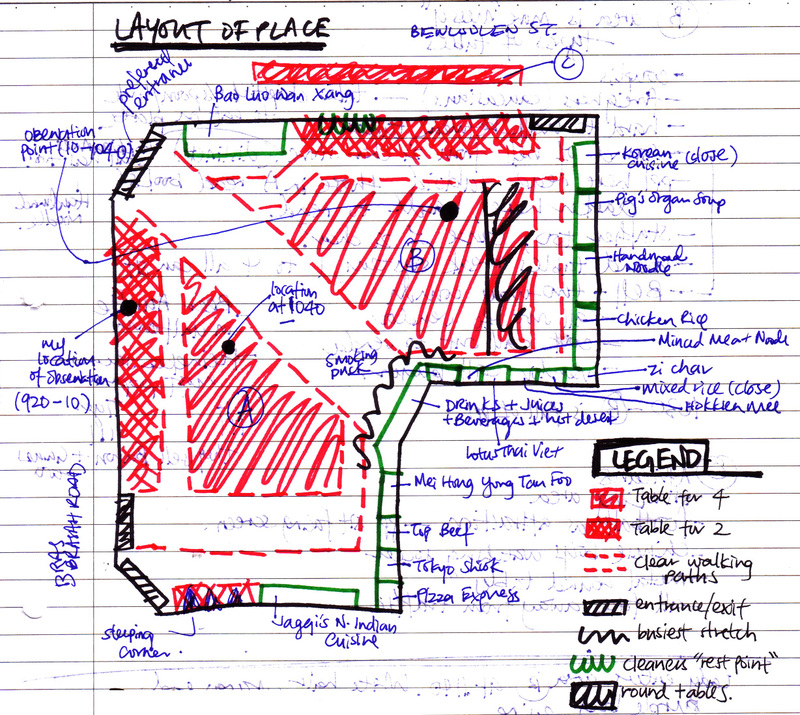 If you’re interested, read a similar, but more imaginative study I did of Yangtze Cineplex here.